Consuming vegetables is crucial in order to be healthy, unfortunately. My dilemma is that while I enjoy eating vegetables, I despise cooking them. I don’t know what it is in my brain but vegetables are not as important to me as meat and starchy carbs. Raw vegetables are not my favorite and you can only eat so many spinach salads before you just skip vegetables altogether. How do you solve that issue so that you aren’t force-feeding yourself raw broccoli and carrots? 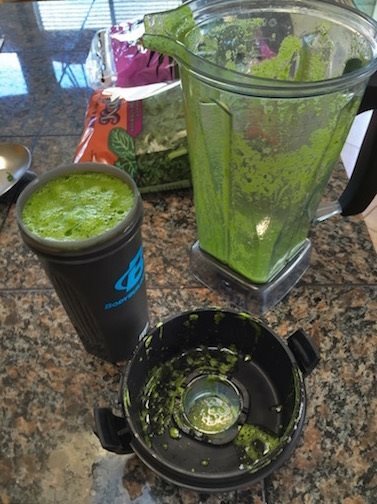 …Throw your veggies into the blender and drink them! My go-to smoothie is spinach, kale, cucumber, celery, lemon and an apple. I love lemon so I pretty much always add it, but the apple may or may not always be included. 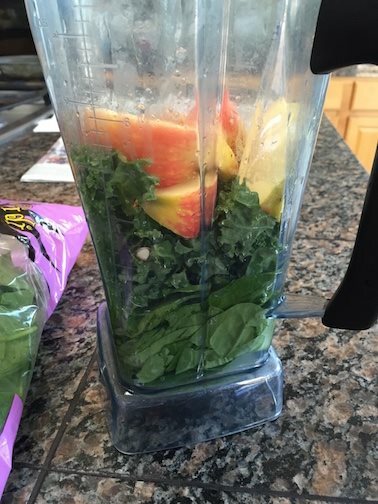 Basically, I fill the blender with greens vegetables; add fresh lemon juice and a piece of fruit. Fruit is essentially sugar so make sure your fruit added is significantly less than the vegetables. Side note: Green smoothies are also my go-to when I drank too much “awesome juice” the night before.